The English writer Stevie Smith liked to write about characters who disappeared into the objects of their gaze. In one of her stories an office girl goes to the National Gallery during her lunch break and studies Turner seascapes until “the spray reached out and sucked her in.” It’s easy to understand getting “sucked in” or swept away by a painting when you see the Frick Collection’s new show: Turner’s Modern and Ancient Ports: Passages Through Time. J.M.W. Turner Cologne, the Arrival of a Packet-Boat: Evening, exhibited 1826. Oil on canvas. The Frick Collection, New York. Photo: Michael Bodycomb. The exhibition showcases three extraordinary harbor scenes in the Oval Room. The monumental Harbor of Dieppe: Changement de Domicile and Cologne, the Arrival of a Packet-Boat: Evening (both 1826) painted by Joseph Mallord William Turner, (1775-1851) Britain’s greatest land and seascape painter of the 19th century. In the past, these two luminous paintings were in the Frick’s large gallery, facing each other, along with works by Rembrandt and Bronzino, among others. They were purchased more than a hundred years ago by Henry Clay Frick. The third port scene, The Harbor of Brest:The Quayside and Chateau (1826-28), borrowed from the Tate, hangs between the two Frick paintings. The radiant Brest painting (1826-28 )was never finished, but it gives you a chance to study Turner’s technique. He appears to start out with yellow blue, orange and brown pigments, placing dark shadows, abstract and blurry, where crowds, boats, and people will eventually be painted in. Lushly atmospheric with evanescent images, the port trio reveal what makes Turner Turner… a dazzling treatment of light and color. “We are thrilled to provide our audiences insight into Turner’s masterful technique by reuniting the Frick’s ports, which themselves have never before been the focus of an exhibition, with a third harbor scene from the Tate on a similar scale…” says Galassi. 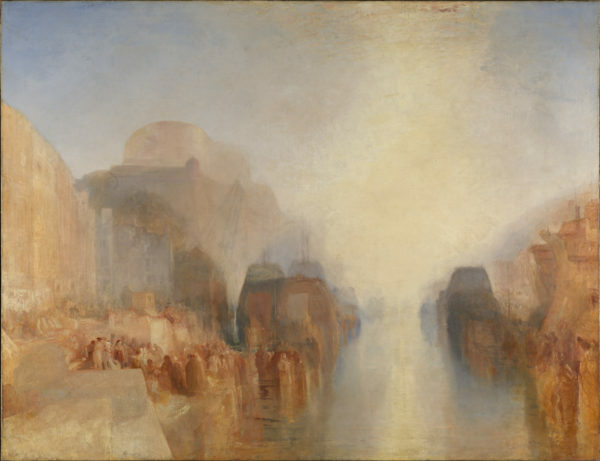 Yet these works were attacked by Turner’s critics who much preferred his earlier works praising them for their accuracy and technical virtuosity. In contrast, they pronounced his more mature style confusing and chaotic. All quite true but greatly admired today. One harsh critic, Robert Haydon, voiced the case against Turner in his diary as quoted in Franny Moyle’s wonderful new Turner biography. Turner’s pictures always look as if painted by a man who was born without hands, and having contrived to tie a brush to the hook at the end of his wooden stump, he managed by smudging, bungling, scrawling, twisting, and splashing to convey to others a notion of his conceptions…he devotes himself solely to the effects & colours of what he sees. 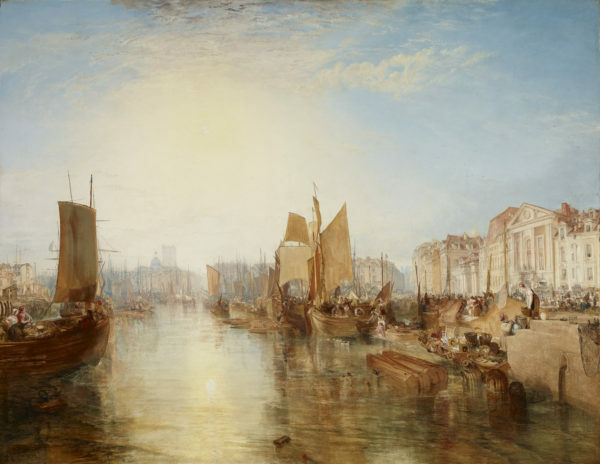 Of course, it is just that alchemy on canvas, the priority of light and water and the sun’s radiance that makes Turner’s paintings so compelling. They have a golden atmosphere, idealized, even romantic. 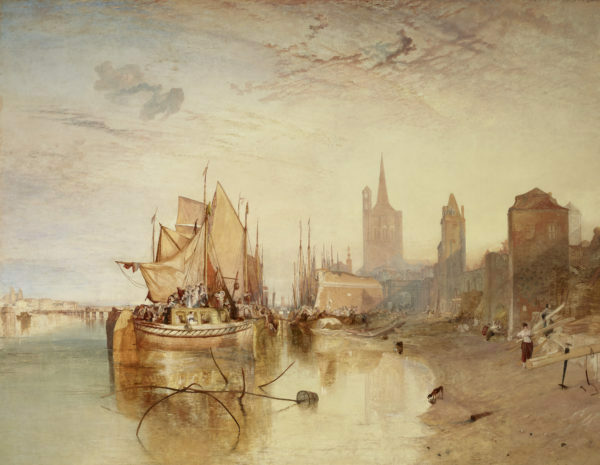 To preserve his nostalgic view of the ports, Turner excludes steamboats from his harbor paintings even though they were quite popular at the time. ( Coal fires and billowing smoke stacks rarely appear.) 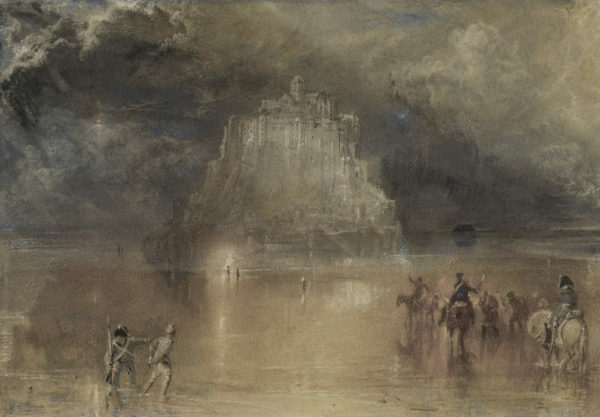 In general, Turner avoids depicting the effects of the industrialization that was transforming England and the Continent to a much lesser degree. Instead Turner presents an idealized sunny world and fills his canvases with sailboats, classic buildings, churches, and locals in peasant dress doing daily chores …all very exotic and tantalizing to a visitor from England. J.M.W. Turner Mont-St. Michel, Normandy, for The English Channel, ca. 1827 Watercolor on paper. The Hecksher Family Collection Image courtesy Fine Arts Museums of San Francisco: photo Randy Dodson. More than 30 of Turner’s oil paintings, watercolors, sketchbooks and prints from France, Germany and Rome accompany the trio of port scenes along with imagined scenes set in ancient Carthage and Rome in an adjacent gallery. Often, atmospheric effects take precedent over topographical accuracy. One exception is the watercolor of the Mont-St-Michel (1827) monastery in Normandy. In this night scene, illuminated by the moon, the medieval abbey is instantly recognized. On the flat sands below, French officers are chasing smugglers who have taken advantage of the low tide. Today, we praise Turner’s poetic license, his idealized visions of shimmering ports painted in an exquisite palette of watery golds and blues. His lack of descriptive detail only reinforces T.S. Eliot’s sentiment when he said that humankind cannot bear very much reality. It’s also fitting that the Turner Prize, the art world’s prestigious prize awarded to a British visual artist under 50, celebrates an artist who defied the critics with his “chaotic and confusing” paintings. On view through May 14, 2017, The Frick Collection, 1 East 70th Street, NY.